MILLER is pleased to present Lisa Sigal’s Utopia Free, a solo exhibition of new cardboard and plaster works. “Curbside” is a series cast from, with, and on cardboard. Splayed and sprayed sections of the exterior and interior of shipping boxes hold an inventory of marks, branding, shipping labels, remnants of packing tape, stains and effects of weather. Like spongy palimpsests, the cardboard surfaces have absorbed impressions of past use, tracing records of times and places, and raising questions about systems of distribution. While remaining formally abstract, the graffiti-like scratches and outlines of fences, beds, and carts diagram the absence of an object. Multiple frames, filled with images hugging their edges, nest inside each composition, serving to merge the container with the contained. Imagery and its support contribute to a logic of material transformation by referring us to a cycle of transference and exchange outside the studio. Mat (Utopia Free), part of “Curbside,” is cast from cardboard pulp and ochre pigment, and resembles a flattened cardboard box. The piece functions like a shield or amulet to ward off the effects of capitalism. This hybrid image/object evaluates the things we prize as fugitive impressions, captured in a process on their way to the garbage, or renewed for future circulation in defense of meaning. The plasters in “Break It Down” were made by sandwiching a core of plaster between sheets of heavy and translucent paper, mimicking the mechanical fabrication of drywall. These plasters explore a process of practical and experiential sensations of time and place, recorded on the most common and ubiquitous material. Painterly incidences of color, density, and luminosity alter the physical nature of the materials. Taken together, the works investigate how art can challenge set ideas about value, property, structure and containment. *This definition of “blight” is featured in a glossary of development terms, which will be highlighted in Blights Out For Mayor, a billboard project in New Orleans. Blights Out (www.blightsout.org) is an activist, artist, and architect and citizen collective in New Orleans, cofounded by Lisa Sigal, formed to fight housing injustice. Lisa Sigal is an artist based in Brooklyn. Her work has been exhibited nationally and internationally at The Whitney Museum's Biennial 2008, The New Museum, MoMa/PS1 Museum, The Sculpture Center, the Aldrich Contemporary Art Museum, The Albright Knox , the Brooklyn Museum, Prospect .3 International Biennial in New Orleans, the DeCordova Museum in Boston, the Essl Museum in Vienna, LAXART space in Los Angeles, Samson Projects in Boston, The Mattress Factory and the most recent iteration of the Anyang Public Art Project, Korea among other venues. As part of the Percent for Art program Sigal’s art will be permanently displayed by the MTA. Her work has been reviewed in Art in America, Artforum, Art News, Time Out and Modern Painters among other publications. Sigal is a 2015 Anonymous Was A Woman, grantee, 2012 Art Matters Foundation grantee and Creative Capital grantee, a 2011 Guggenheim Fellowship awardee, a 2002 NYFA grantee and received the Joan MItchell Foundation Grant and the Elizabeth Foundation Grant in 1998. Sigal has been an artist-in-residence at the Joan Mitchell Center, the Skowhegan School of Art, the Headlands Center for the Arts, the Ballinglen Arts Foundation, Ireland, and the Sharpe Walentas Studio Program. She received a BFA from the Tyler School of Art in 1985 and an MFA from the Yale School of Art in 1989. Sigal is a founding artist/activist of Blights Out a coalition of people generating art, dialogue and action around the issues of blight, housing affordability and gentrification and in support of housing as a human right. 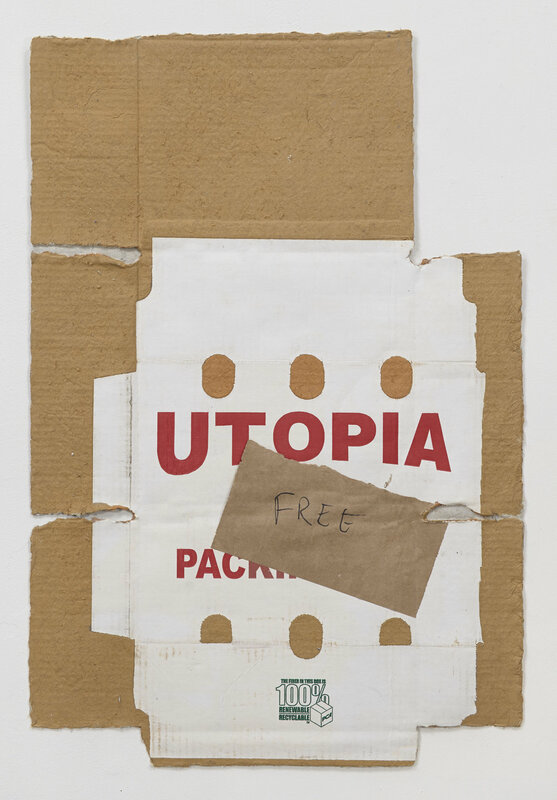 Image: Mat (Utopia Free), cast cardboard pulp with collage, 32 x 21.5 inches, 2016. Courtesy MILLER.